A little while ago my son was showing some interest in robotics. His birthday was coming up and we were having trouble deciding between a beginner robot kit focused more on construction or lots of bits and pieces. The alternative was to build a robot based around Arduino. There are many robotics kits out there but I liked the idea of investing in Arduino as the basis for exploring robotics. I figured we would get the Arduino Uno, a few shields to control motors and sensors and whatnot, throw some wheels on it, and blammo, have a robot. Then the shopping set in. There is a multitude of places to buy a multitude of robot stuff. I was tempted by RobotShop’s DFRobotShop Rover. Arduino compatible, everything we need to get started. And it was on sale at the time I was looking. In the end, we bought our son the OWI ATR kit mentioned above for his birthday and I ordered a bunch of bits and pieces instead of the RobotShop Rover to build something more advanced with him. He really enjoyed the OWI ATR kit – he likes to build with his hands so it was the right balance of technology and construction. 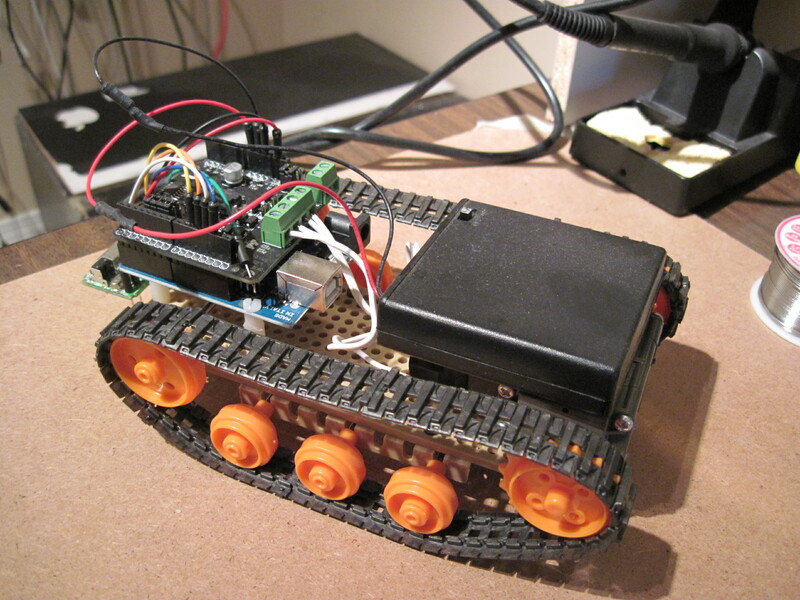 For the Arduino robot project, I decided to start with a simple remote controlled tank. I really had no specific plan though I had searched around a bit on YouTube and such to see that others had managed to throw something together. I ordered everything from Amazon though not everything was fulfilled by Amazon so I paid shipping for a few things. Otherwise, I tried to spend as little as possible. For the mechanicals, I used cheap Tamiya plastic bits. The instructions on these are not the most verbose but my son and I managed to stumble through without any damage to ourselves or the parts. For the brains behind the operation, I went with a fairly stock setup with an Arduino Uno and a Motor Shield from DFRobot. Additionally, I wanted to use a wireless Playstation controller for the remote control. I picked up a used Logitech wireless PS2 controller from my local Gamestop (since closed). You can find them on Amazon as well. Another option is the Hydra PS2 controller. I allowed myself a bit of luxury by buying jumper wires. A battery pack to hold four AA batteries seemed like enough power. Assembled tank chassis with motors. After building the chassis, the motor, and doing a quick test with the battery pack connected directly to the motors, I moved on to attaching the Uno and motor shield, I had some 1.5 inch nylon standoffs with screws that I used to mount the Arduino complex to the chassis. I did another quick test controlling the motors using the Arduino + Motor Shield. Finally, I tore apart the wireless dongle for the PS2 controller, soldered on some jumper pigtails and connected it to the Arduino. Using PS2X from Bill Porter, I got basic remote control working pretty quickly. Wireless controller dongle hanging off the back of the tank. Overall, the little tank worked pretty well and we had fun building it. I think the four AA batteries aren’t really enough to power the system as I couldn’t drive both motors in opposite directions simultaneously (or there is a bug in my code which is equally possible). 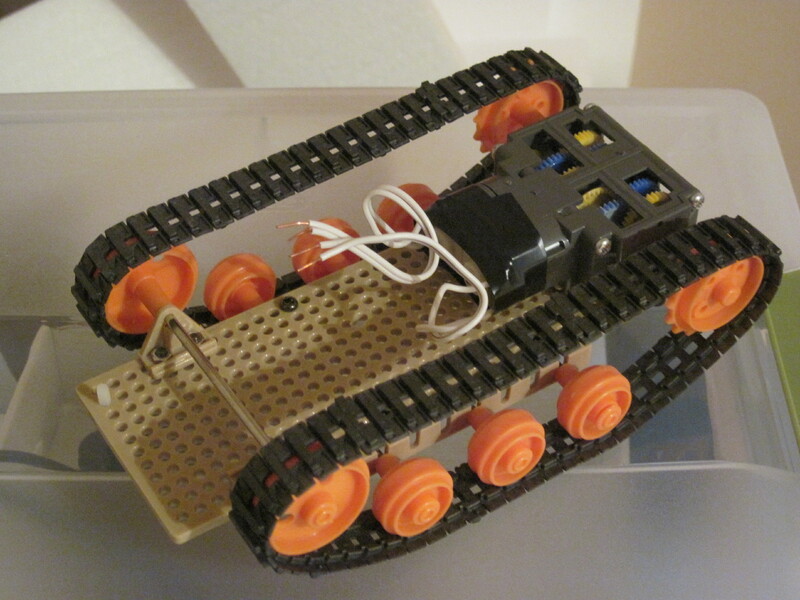 Assembled tank with battery pack. Since we built this, I’ve used the Arduino for a number of projects (yet to be posted) and picked up an Ultrasonic sensor that we’ve yet to put into use on the tank. That’ll have to be a future post. Here’s the items I used with links to Amazon (based on looking at my order history). Here is a Fritzing diagram for this project. A few people have asked for book recommendations for learning to code for Arduino. My son found the following book useful when he was doing projects with Arduino. Next Post Ancient History: Let’s Build Our Own Console! 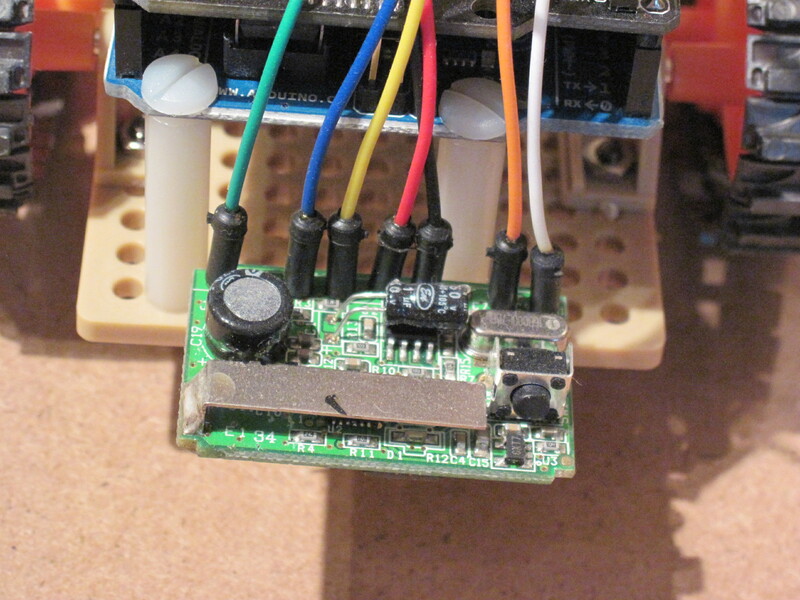 Pingback: Building a rather rudimentary Arduino tank bot | Daily IT News on it news..it news..
Nice writeup, you don’t by chance have a parts-list of what you bought? The only link you gave was to a kit that looks cool, but nothing about parts used in the main part of your article. Thanks. I updated the post with a list of the parts I used at the bottom with links to Amazon. I bought everything from Amazon except the PS2 controller and the battery holder. And one other thing: wasn’t better a 9 V single Battery rather than 4x 1.5 AA batteries? I was going to do a Fritzing schematic for the wiring but didn’t get a chance to do it before I took the tank apart. The pin numbers are referenced in the code above and generally followed the defaults for both PS2X and the motor shield. If I get a chance over the coming days I’ll see if I can’t throw together a schematic. I had the idea for a Arduino tank able to dodge obstacles thanks to a ultrasonic sensor(in my case the SRF05) and put it in practice(Instead of the arduino motor shield I used the SN754410). Once I finished it, I tought that it was possible to make it switchable from the auto-mode to a wireless-controlled configuration, so I’m thinking to take cues from your project and apply them to my. Scott, I honestly don’t remember. I suspect it was either in some of the sample code for the motor shield or it was the first thing that popped into my mind. 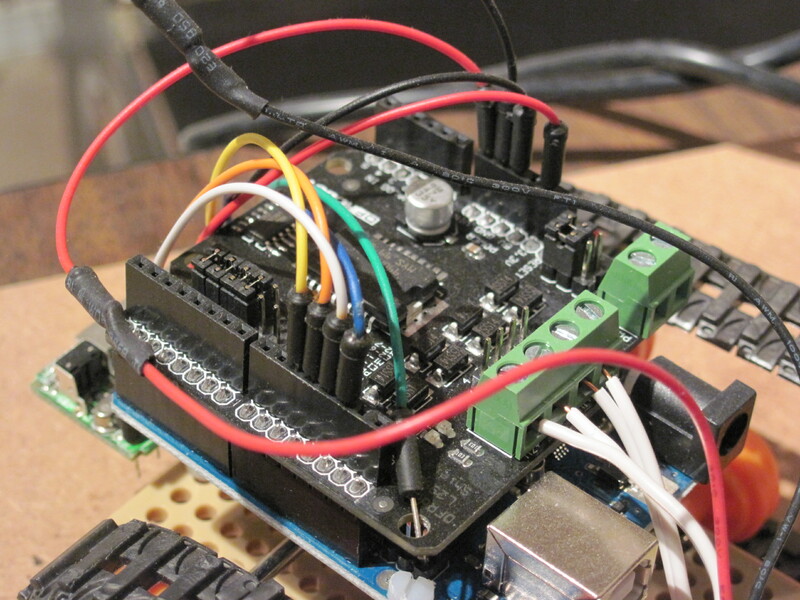 Also, on the Arduino motor shield, where does the green wire go? Scott, that green wire is an extra jumper from the PS2 wireless dongle (you can see it on the left of the picture of the dongle). It is just tucked into the screw hole of the arduino for safe keeping since it was not needed for this project. I really liked the content on the site. Congratulations! I’m doing a test here soon in order to control my “Mini Dalek” through PSx, however when making connections Wifi receiver and run the example, I see / get any key information that is being precionada, even if not touching in control. The control is OK. ps is a Generic Controller Wifi. I managed to find the error, was feeding when fed the receiver 5v worked, stabilized and not give errors. I don’t have any pcb schematics for this project. It was just wiring together a bunch of off-the-shelf parts. I don’t even have the wiring diagram from this project anymore. The wiring was pretty straightforward. If you look around the web you can find a few people who did their own version of this project and some of them, I think, have wiring diagrams. Could you give me schematic of how to connect wires. Hi Ed, I will try to update this post with a fritzing diagram or something. The arduino pins used can be found in the code. and for the PSX controller, I used the default pins as well (13,11,10,12). which color wire do the 6,7,5,4 corispond to? I added a Fritzing diagram that should hopefully make the wiring a little clearer. Note that the E1/M1 E2/M2 connections are handled through the motor shield pairing to the Arduino so there are no wires for it. Hey, could you use a different wireless controller like a PS3 wireless controller?